List at least four sources of reliable and accurate nutrition information. A motivational speaker once said, “A smart person believes half of what they read. An intelligent person knows which half to believe.” In this age of information where instant Internet access is just a click away, it is easy to be misled if you do not know where to go for reliable nutrition information. There are a few websites that can be consistently relied upon for accurate material that is updated regularly. “New study shows that margarine contributes to arterial plaque.” “Asian study reveals that two cups of coffee per day can have detrimental effects on the nervous system.” How do you react when you read news of this nature? Do you boycott margarine and coffee? When reading nutrition-related claims, articles, websites, or advertisements always remember that one study does not substantiate a fact. One study neither proves nor disproves anything. Readers who may be looking for complex answers to nutritional dilemmas can quickly misconstrue such statements and be led down a path of misinformation. 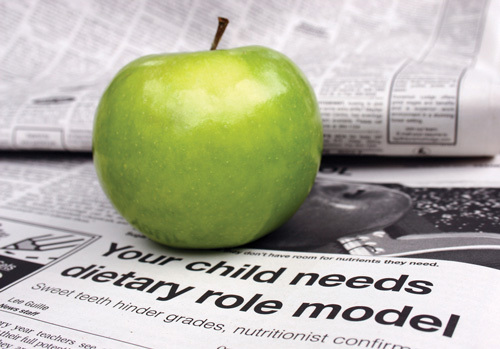 Listed below are ways that you can develop discerning eyes when reading nutritional news. The scientific study under discussion should be published in a peer-reviewed journal, such as the Journal of the International Society of Sports Nutrition. Question studies that come from less trustworthy sources (such as non peer-reviewed journals or websites) or that are not published. The report should disclose the methods used by the researcher(s). Did the study last for three or thirty weeks? Were there ten or one hundred participants? What did the participants actually do? Did the researcher(s) observe the results themselves or did they rely on self reports from program participants? Who were the subjects of this study? Humans or animals? If human, are any traits/characteristics noted? You may realize you have more in common with certain program participants and can use that as a basis to gauge if the study applies to you. Credible reports often disseminate new findings in the context of previous research. A single study on its own gives you very limited information, but if a body of literature supports a finding, it gives you more confidence in it. Peer-reviewed articles deliver a broad perspective and are inclusive of findings of many studies on the exact same subject. When reading such news, ask yourself, “Is this making sense?” Even if coffee does adversely affect the nervous system, do you drink enough of it to see any negative effects? Remember, if a headline professes a new remedy for a nutrition-related topic, it may well be a research-supported piece of news, but more often than not it is a sensational story designed to catch the attention of an unsuspecting consumer. Track down the original journal article to see if it really supports the conclusions being drawn in the news report. Are names and credentials disclosed? Is an editorial board identified? Does the site contain links to other credible informational websites? Even better, does it reference peer-reviewed journal articles? If so, do those journal articles actually back up the claims being made on the website? Are you being sold something at this website? Does the website charge a fee? Now let’s consider some reputable organizations and websites from which you can obtain valid nutrition information. Centers for Disease Control and Prevention (CDC): The Centers for Disease Control and Prevention (http://www.cdc.gov) distributes an online newsletter called CDC Vital Signs. This newsletter is a valid and credible source for up-to-date public health information and data regarding food, nutrition, cholesterol, high blood pressure, obesity, teenage drinking, and tobacco usage. The Academy of Nutrition and Dietetics (AND): The AND promotes scientific evidenced-based, research-supported food and nutrition related information on its website, http://www.eatright.org. It is focused on informing the public about recent scientific discoveries and studies, weight-loss concerns, food safety topics, nutrition issues, and disease prevention. US Department of Agriculture (USDA): The USDA site http://fnic.nal.usda.gov has more than twenty-five hundred links to dietary, nutrition, diet and disease, weight and obesity, food-safety and food-labeling, packaging, dietary supplement and consumer questions sites. Using this interactive site, you can find tips and resources on how to eat a healthy diet, my Foodapedia, and a food planner, among other sections. US Department of Health and Human Services (HHS): The HHS website, HealthFinder.gov, provides credible information about healthful lifestyles and the latest in health news. A variety of online tools are available to assist with food-planning, weight maintenance, physical activity, and dietary goals. You can also find healthful tips for all age groups, tips for preventing disease, and on daily health issues in general. Dietitians of Canada: Dietitians of Canada, http://www.dietitians.ca/, is the national professional association for dietitians. It provides trusted nutrition information to Canadians and health professionals. Health Canada: Health Canada, http://www.hc-sc.gc.ca/index-eng.php, is the Federal department that helps Canadians improve their health. Its website also provides information about health-related legislation. Reliable nutritional news will be based upon solid scientific evidence, supported by multiple studies, and published in peer-reviewed journals. Be sure the website you use for information comes from a credible and trustworthy source, such as the USDA Food and Nutrition Center, the HHS, and the CDC. Discuss why it is important to get information from proper and credible sources and not to rely upon single study findings.